The band started in the fall of 1998 when John Kadlecik (mandolin and fiddle), Bob Lait (guitar), Michael Hazdra (bass), (Wavy) Dave Burlingame (banjo), Lisa Mackey (vocals) and Dave Muhlethaler (fiddle and mandolin) got together to form a bluegrass side project. Mike and John had recently started playing together in the Dark Star Orchestra. Dave Burlingame was playing bass for several blues and bar bands as well as learning banjo. Bob and Lisa were playing in a group Fenario and the Shotgun Ragtime Band. Muhlethaler was a professional street musician. Hog Head McDunna's was the first run of shows for the Dime Store String Band. This is when John named the band. Because the demands of all the projects, Dime Store got together on musicians night off, Monday. After a couple of years Dave Muhlethaler moved to Madison Wisconsin and left the band. Tom Murray, who played with Bob and Lisa in Fenario, joined to replace Muhlethaler on Fiddle. Mike left Dark Star Orchestra to get off the road, and started the regular Monday night with Bob. They still get together every Monday to play bluegrass and enjoy Mary's (Bob's wife) baked cookies and cakes, with few exceptions. Around this time Lisa joined DSO. As DSO started touring more rigorously, John and Lisa showed up on Monday's less and less frequently. Whenever John was in town he would book Dime Store at Martyr's. Dave Burlingame was also in the very successful jamgrass band, Cornmeal, with Chris Gangi. Chris started coming to Monday nights playing mandolin. 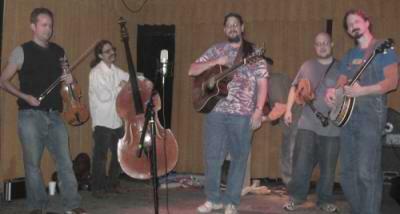 Dime Store started hosting a jam before Terrapin Flyer on Sundays at the Boulevard Cafe around 2002. Around the same time Tom started booking us shows at the Uncommon Ground. When Dave and Chris were on the road with Cornmeal, Ben Wright (now with Outlaw Family Band) and Martin McWhorter, from Back Porch Ramblers, came to fill in on Banjo and Mandolin. Martin stayed on, Chris was busy with Cornmeal and teaching at the Old Town School. Different musicians came and went at the regular Monday nights at Bob's. Ruby Harris (fiddle), Chris Gangi (bass and mandolin), Rick Veras (fiddle), High on the Hog from Colorado, Jeff Sachs and Erin O'toole from Home Kookin', Jason Berger (mandolin), among others. While Dime Store was filling in for Cornmeal at Griffin's Pub, Dave Bragman filled in on banjo. James Weigel from OFB came out and sat in on Dobro at the Uncommon Ground. Bob Lait fills in on guitar and vocals once in a while with Cornmeal. Bob is also a painter, you can visit his artwork on his website. Dave is busy with Cornmeal. Tom Murray was a founding member of Chicago favorites' Stump The Host and Planet Warehouse. He also performed two seasons with the Civic Orchestra of Chicago, training orchestra of the Chicago Symphony Orchestra. Currently, Tom is writing a novel. When not playing with DSSB, Michael Hazdra is playing eclectic folk in the George Matteson Trio. Martin has left DSSB and played with Henhouse Prowlers. Martin moved to Ireland in November 2007. Mike Kearns is now filling the mandolin spot. Dave Bragman has retired. Wavy Dave sits in now and again when he is not touring. Take a look at our Shows page to see when we are playing next.